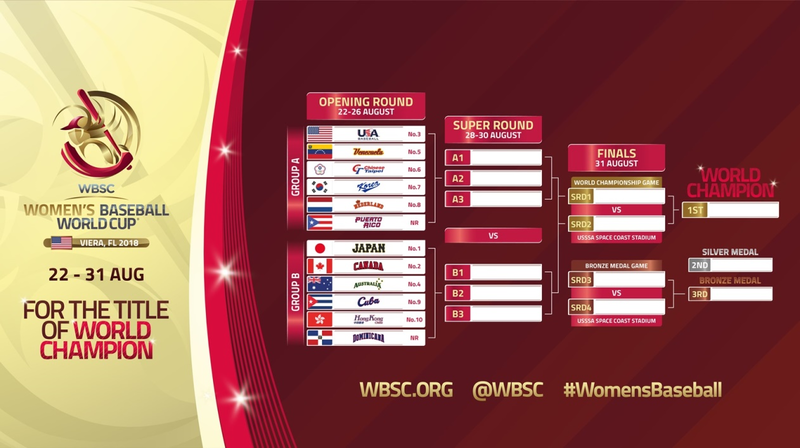 LAUSANNE, Switzerland -- 09 April 2018 -- The World Baseball Softball Confederation today revealed the groups and tournament bracket of the WBSC Women's Baseball World Cup® 2018, which will be staged at the USSSA Space Coast Complex in Viera (FL), USA, from 22-31 August. The 12 qualified nations have been drawn into two groups of six and will begin the women's baseball flagship competition with a round-robin. Host United States, 2016 bronze medal winner Venezuela, Chinese Taipei, Korea, Netherlands and unranked Puerto Rico will face each other in Group A. Group B holds five-time defending world champion Japan, 2016 runner-up Canada, Australia, Cuba, Hong Kong and first-timer Dominican Republic. "This is always an important and exciting moment when the teams discover their opening round opponents and map out the path needed to claim the Baseball World Cup trophy," said WBSC President Riccardo Fraccari. Said USSSA Assistant Executive Director Don DeDonatis III: "It's a great honour to host the best female athletes in the sport of baseball, and with the groups now known, we will accelerate rolling out and tailoring an unbelievable Baseball World Cup experience - both on and off the field - for the athletes and spectators expected from around the world. We have been working diligently with leaders from the local community in preparation for creating an iconic Women's Baseball World Cup experience." The top three finishers from Groups A and B will advance and go head-to-head in the Super Round. The two Women's National Teams with the best win-loss records following the Super Round will compete For the Title of World Champion on Friday, 31 August. The game schedule, broadcast and live-streaming details will be announced in future releases. The WBSC Women's Baseball World Cup 2016, in Gijang, Korea, registered a broadcast reach of approximately 100 million households and generated over 27 million social media impressions, with an online viewership of more than 6 million views from 198 countries and territories.